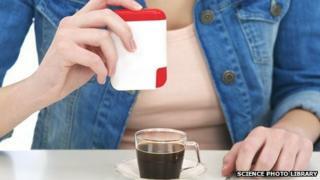 The artificial sweetener aspartame is safe and poses no threat to health, European food regulators conclude. The European Food Safety Authority brought forward its review, planned for completion by 2020, at the request of the European Commission. Since it came into use in the 1980s, a number of medical studies have questioned aspartame's safety. The EFSA says it left "no stone unturned" during its full risk assessment. As well as looking at the available clinical evidence, the EFSA said it listened to stakeholders and considered over 200 comments submitted to its online public consultation. Aspartame, which sometimes appears on labels as E951, and its breakdown products are safe for human consumption at current levels of exposure, says the EFSA. Approximately 200 times sweeter than sugar, the low-calorie sweetener is used in many foods and soft drinks. An Acceptable Daily Intake, or ADI, is set at 40mg per kg of body weight per day. This is equivalent to 2800mg for an average British adult. For an average 3-year-old child the amount is around 600 mg. The only exception is for people suffering from a rare genetic disease phenylketonuria who cannot safely consume aspartame. For most products containing aspartame, consumption would need to be exceptionally high and regular over a person's lifetime, in order to exceed the ADI. Dr Alicja Mortensen, who chaired the EFSA's aspartame review panel, said: "This opinion represents one of the most comprehensive risk assessments of aspartame ever undertaken. "It's a step forward in strengthening consumer confidence in the scientific underpinning of the EU food safety system and the regulation of food additives." Catherine Collins, Principal Dietitian at St George's Hospital NHS Trust, welcomed the findings, saying: "Aspartame has been the sweetener with the biggest 'conspiracy theory' stories ever- ranging from behaviour issues in children to liver damage and cancer - all totally disproven, yet again, by this detailed scientific review."